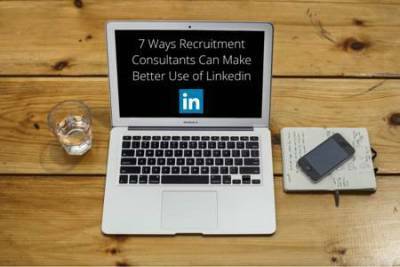 In just a few years, LinkedIn has engulfed the recruitment industry to become a must-use tool in our daily lives. Yet despite the amount of time that Recruitment Consultants spend on the platform, it is surprising to see not everyone is using the site to its full potential. As a Rec2Rec recruitment business, our home feed is a stream of recruitment consultants' posts. What's fascinating though is that we often can't tell anything about a recruiter’s specialism - or why candidates or clients should work with them. That is because they've failed to make proper use of their LinkedIn headline. Let's pause for a minute to reflect that throughout LinkedIn, the information that a person is most likely to see about you is i) your name, ii) your photo and iii) your headline. Given that's the case, your headline should immediately convey to people why they should click through and take a look at your profile. Which of the following do you think would be more likely to attract a click from a Telecoms candidate or hiring manager? ... hands down the second headline, right? Yet the former is more commonplace in our industry than you might expect - and is such an easy thing to correct. Another shortcoming we’ve noticed is when recruiters make their LinkedIn profiles all about themselves. Yet if you want to really prompt client or candidate prospects to get in touch, your profile needs to be all about them. Or rather, your profile needs to be all about addressing their needs and frustrations. So what do clients want in your market niche? Perhaps they would like to work with recruitment consultants who go above and beyond the competition - and have a repeat business rate to prove it. Or to work with a recruitment consultant who has glowing testimonials from candidates and clients they respect. Or to work with recruitment consultants who have a success rate that's the envy of other recruiters in the industry.... The list could go on and on, but the point is that if you're looking to drum up client interest then your profile should tap into your prospects' frustrations and headaches and how you can address them. The same principle applies if yours is a market that is short of candidates and it is candidate interest that you really want to generate. Focus on how you are different from others in the recruitment industry and the fact that candidates will not experience the frustrations they've experienced with other recruiters, if they work with you. Last but not least, it is well worth researching and brainstorming the keywords that need to appear somewhere in your profile. What skills and specialisms might a prospective candidate or client include when searching on LinkedIn? Making sure you have all of these covered is how you drive up the number of times that your profile appears in relevant users' search results. The problem with this approach is twofold. Firstly, it really harms your visibility on LinkedIn. You see LinkedIn's algorithm includes your updates on people's homepage only if your network of contacts consistently finds your posts valuable and engaging. So share too much that people view as promotional - and don't engage with or click on - and within days your posts could cease to appear on people's homepages any longer. Add to that the fact that people will choose to mute your posts (ie. actively choose to no longer see them) and it becomes clear that promote, promote, promote is not a strategy that’s going to serve you well when it comes to your LinkedIn updates. Instead focus on Give, Give, Give! Share trends, interviews, data and insights that'll be super valuable to people in your industry. Share them in ways that encourage people to join the discussion. Comment on other people's posts. Every time someone interacts with you, your profile will start to appear in the homepage feeds of their connections. So if you want to dramatically increase your visibility in your niche market, our experience is that the less you promote things the more your own professional brand will ultimately gain visibility on LinkedIn. No doubt you will relate to this. Ask any successful recruiter and they will tell you that a sales call to a warm lead has a much higher probability of success than a cold call. Right? Yet, as an industry, we often don’t apply this logic to our LinkedIn activities. If you want to win new clients on LinkedIn, an InMail out of the blue to introduce your services is unlikely to produce results unless the client is really in dire straits. It's the LinkedIn equivalent of a cold call. The alternative approach is to first draw up your list of target client prospects. Research which groups they've been active in, take a look at their activity stream. Find opportunities to join in with conversations they are already having on LinkedIn. Not in a salesy way, but in a way that adds value to the conversation; or that helps them overcome whatever challenge it is that they are facing; or that shares the message they are trying to broadcast so that you help them reach a wider audience. By spending some time befriending people like this you'll find they open up and want to connect with you, want to have conversations - and ultimately will be much more receptive to a call to discuss their needs. You have created yourself a warm lead, the LinkedIn way! Marketers have demonstrated for decades that consumers are far more likely to buy if promotions are personalised to that individual. Personalised with their name - and personalised to connect with their circumstances. In recruiting this is particularly true. Candidates (and clients) are more likely to respond to messages that have been personalised to them. But even more than this, they are more likely to respond to messages that feel like they have been written from one human being to another. As an industry, we expect candidates to write CVs and Cover Letters that have been tailored to the specific position being applied for (rather than sending applications in bulk). Yet when it comes to our own messaging on LinkedIn, not every recruiter goes to the same trouble. Often recruiters are tempted to send lots of copy and paste messages when sending a smaller number of personalised messages would be far more likely to convert. The recruiters excelling on LinkedIn tend to go the extra mile and make sure that every interaction and every message is personalised and makes the recipient feel like they've chosen to interact with them and them alone. This could be a whole article in itself, but in summary it is best not to rely on basic LinkedIn searching to uncover every candidate for your vacancy. Instead use advanced LinkedIn search techniques and become a master of searching LinkedIn via Google. Both will help uncover candidates that you (and your competition and client) will likely have missed. Last but not least, it's always good to have an impartial check of the effectiveness of your activities. So why not use LinkedIn's free social selling index to get personalised insights into how you are performing on LinkedIn and where you have room for improvement? (How did you score out of interest, do tweet us on @GNB_Partnership to let us know). Looking to boost your career prospects in 2016? Hopefully these insights will help you to achieve more success this year. If you feel you need to explore other recruiting opportunities to fulfil your potential, do reach out and we’d be delighted to help. If you'd like to have a confidential chat about your options and your marketability, simply give us a call today on +44 (0)203 463 8653.